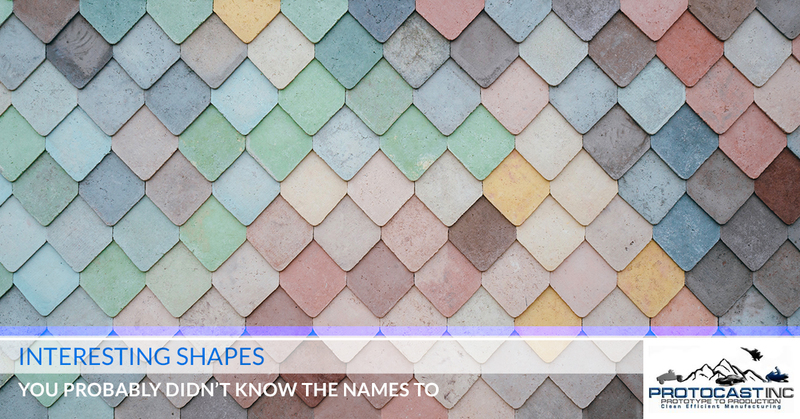 Circles, squares, octagons and even parallelograms – in school, most people are taught basic shapes at a relatively young age, and continue on to learn about more complex geometrical arrangements in the context of math class. Now, with that being said, do you really know what an enneagram or a triquetra is? Perhaps so, but our point here is that there exist a number of lesser-known shapes that people may visually recognize, but couldn’t put a name to even if it was a final Jeopardy question. In this random hypothetical, knowing your novel shapes can really pay off! Jokes aside, your Denver aluminum prototyping experts here at Protocast Inc. commonly work with and forge many irregular, oddly-shaped parts and components for many different purposes. From niche engine parts to specific tools for manufacturing companies, our aluminum prototype casting services are precise, quality-oriented, and more importantly, consistent. Our machine shop in Denver takes a great deal of pride in our work, and we’re not happy until you’re happy with our prototype aluminum casting services. We also work with other alloys like magnesium, zinc and stainless steel to meet the exact needs of your production run. Learn more about our work, or feel free to contact Protocast Inc. today about how we can help you bring your prototype to production! Visually equivalent to the capital letter “H”, the balbis is an ideal example of a shape that we come into contact with on a daily basis, blissfully unaware of what to actually call them. Mathematically speaking, the balbis is defined as a single line that is terminated by a secondary line at each end, both of which are positioned at right angles to the primary line. Try recalling this name right off the bat, because most people see this shape and call it the “infinity symbol” – which, to be fair, isn’t wrong. Featuring two loops that meet at a central point, this sideways-eight-looking shape is somewhat common, yet no one seems to remember the name “lemniscate”. Okay, so what about the enneagram? The name “gram” gives you some clue, but what about recalling the name when you see it? Also known as the “Star of Goliath”, this nine-pointed star has actually been adopted as the logo for the popular heavy metal band Slipknot, believe it or not. Seeing as we frequently work with heavy metals, we’re okay with that. Like the hybrid-name “spork,” this shape’s silly name goes against its own identity. Is it a rounded square, or an edgier circle? We’ll let you be the judge. From the infamous squircle to the balbis, Protocast Inc. can create parts far more complex and odd than these ones. Verify your production run for your parts with our Denver aluminum prototyping services today!